Freddie Mercury might well have sung ‘I don’t want to ride my bicycle’ had he been around when the first model was invented in the early 19th century, as it didn’t even have pedals! Invented by a German, Baron Von Drais, in 1818, and named the ‘hobby horse’, the wooden construct relied on the rider’s feet pushing on the ground to propel it. It didn’t really catch on. However in 1839 it did provide inspiration for Scotsman Kirkpatrick Macmillan, whose invention may have pleased Freddie Mercury a little more. His model, once again made of wood (and iron tyres), included pedals’ that connected to the rear wheels – a forward and backward movement of the riders feet, rather like the action of wiping one’s feet on a doormat, turned the wheel and set the machine along the road. Macmillan’s sole motivation for inventing the bicycle was to get himself around, and he didn’t give a thought to establishing his design commercially. Wherever he pedalled, crowds would gather in amazement. On one occasion, the throng was so strong that the cycling Scotsman accidentally knocked over a little girl, for which he was taken to court and fined five shillings. The first bike with modern-style pedals was the 1867 Velocipede or ‘boneshaker’. Turning pedals were attached to the front wheel. 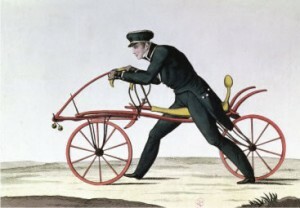 Invented by Pierre Lallement, the Velocopide’ was far from a comfy ride, but it was nevertheless the first bike to undergo successful mass-production by Pierre Michaux in 1861. 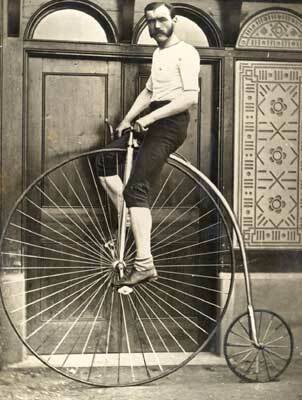 In the 1870’s a British invention followed on from the Velocopide : the Penny Farthing, whose massive front wheel set the rider perilously high up and led to many accidents. It was so named because the smallest coin at the time was the penny, and the largest the farthing. The penny-farthing used a larger wheel than the velocipede, thus giving higher speed on all but steep hills. In addition, the large wheel rolled more readily over cobbles, stones, ruts, and so on. Since rough-paved and unpaved roads were more common than smooth roads, the increase in rider comfort was significant. Penny-farthing bicycles often used similar materials and construction as earlier velocipedes: cast iron frames, solid rubber tires, and plain bearings for pedals, steering, and wheels. They were often quite durable and required little service. While it was a difficult, dangerous machine, it was simpler, lighter, and faster than the safer velocipedes of the time. Though they worked to a degree, they were certainly no good for ‘wheelies’, ‘bunny hops’ or ‘off-roading’ – there was still work to be done. 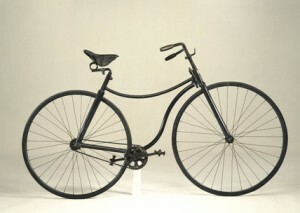 The first invention that resembled today’s bikes was designed and made in 1885 by John Starley, an engineer. Following on from precursory ‘safety bicycles’ with chains, he was the first to make both wheels the same size. His bike was called the Rover Safety, and its design formed the basis of modern frame design.